The Indiana CORE Assessments for Educators are the required teaching tests to take to get licensure. Each state has its own licensure requirements, and the Indiana CORE Assessments for Educators is the place to get information on: what tests to take, requirements for instructional licenses, what to do when adding a content area to an existing license, how to register and get test results, how to prepare for the exams, test taking policies, and faculty resources. From the Indiana CORE Assessments for Educators Web site, a person can register for Core Academic Skills Assessment (CASA) or Developmental (Pedagogy) and Content Area Tests. CASA is Internet based and is comprised of subtests in basic reading, writing, and math. These subtests are one way to demonstrate proficiency in a subject area and gain an entry-level teaching job. CASA offers practice tests for a fee. Prior to registering for CASA, the candidate has to prove basic skill competencies by means of an American college testing (ACT) score of at least twenty-four on math, reading, grammar, and science or school aptitude testing (SAT) score with at least 1100 on critical reading, and math or a graduate record examination (GRE) score with at least 1100 based on verbal and quantitative or a GRE score with at least 301 on the verbal and quantitative section. The developmental (pedagogy) and content area tests are required of candidates seeking an instructional license at the grade level and content area they wish to teach. Upon completion of the exam, the CASA reading and math subtest scores are provided on the computer screen immediately to the candidate. The candidate will not receive preliminary results for the writing section, being that it is constructed response related. Official CASA reading and math scores and developmental (pedagogy) and content area test multiple-choice scores are available ten days after testing. The writing subtests and developmental (pedagogy) and content area tests that included constructed-response assignments take approximately twenty days to appear in the test taker’s account. Taking numerous CASA practice tests is recommended for test day success. Indiana CORE Flashcards. 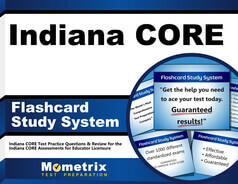 Proven Indiana CORE test flashcards raise your score on the Indiana CORE test. Guaranteed. Final test scores are available per an arranged schedule with the Indiana CORE Assessments for Educators entity. Once released, candidates may view, print, and save the scores for their records. These testing scores are sent to the Indiana Department of Education along with testing history and pass or fail status. The scores for developmental (pedagogy) and content area tests are added to the educator’s licensure. The Indiana CORE Assessments for Educators are designed by the Pearson Education, Inc., a respected leader in the education industry. Explore our free Indiana CORE Assessment review provided by Mometrix. 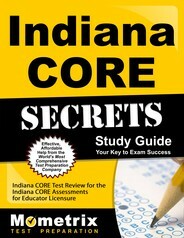 Check out our premium Indiana CORE Assessment study guide to take your studying to the next level. If you benefit from these materials, just click the link below! To compliment our Indiana CORE Assessment book, we also offer extensive Indiana CORE Assessment flashcards for even more Indiana CORE Assessment test prep help. We hope you enjoy our products! Your purchase helps us make more great, free Indiana CORE Assessment certification content for test-takers just like yourself.